Personal service when done right can make the difference between a customer forgetting about you the moment their transaction is over, and that same person becoming a loyal customer for life. 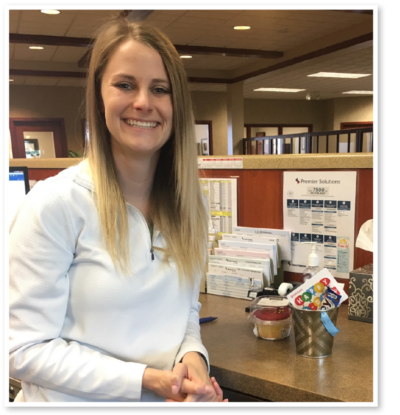 Lauren Lutton, and Brittany Nichols, both Frontline Specialists in Grand Forks recently exemplified personal service by making two customers feel like they were doing business with a human, not a company. Lauren and Brittany are passionate about getting to know their customers personally. Some people are open books, and respond to her friendly comments right away. But some are more reserved, and take more time. Near the end of 2015, Lauren began to notice a drive up customer who was so reserved he’d write notes on scraps of paper rather than speaking his banking requests. She made it her mission to bring him out of his shell, by being extra friendly, and offering candy and snacks from the lobby to coax out tiny bits of conversation. 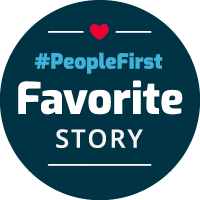 Customer Service is surely a team sport at Choice, because at the same time, Brittany was working on a completely separate instance of customer service brilliance. Charles, another regular customer, told Brittany that he would be getting married soon, and was excited to take his new wife on a honeymoon trip driving through the Black Hills. Right away, Brittany started to plan a way to celebrate this milestone for him. 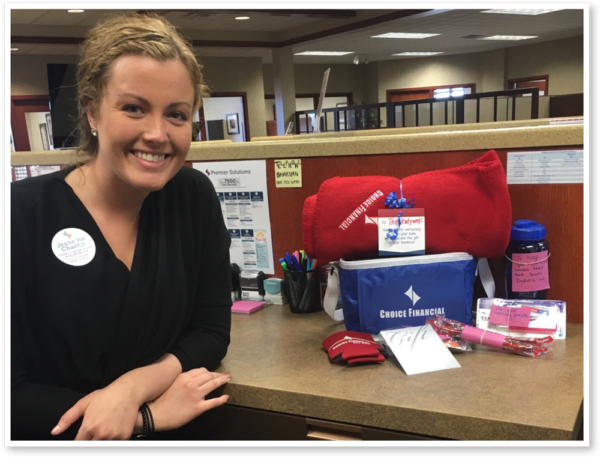 She gathered Choice Financial giveaways, like water bottles, koozies, some maps, and put them into a travel size cooler, along with a VISA gift card. Each item had a humorous note attached explaining why the item was included. Brittany called Charles and asked him to come to the bank one day, under the ruse of having forgotten to get his signature on a transaction. When he came in, she and Lauren presented him with this personalized gift. Charles laughed upon reading each of the notes and was very appreciative of the thoughtful gift. By simply finding out tiny details about their customers, and being empowered to act on their innate friendliness, both Brittany and Lauren made their interactions more personal and really kicked their customer service up a notch!